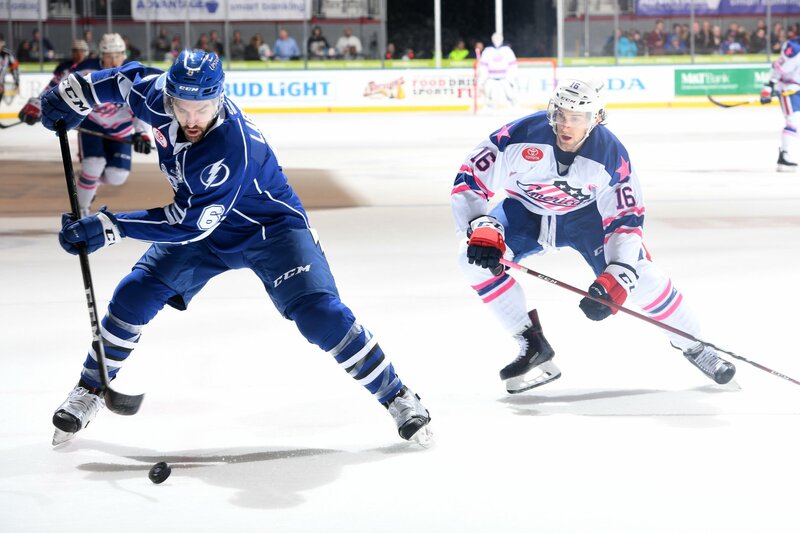 6-1 Win Gives Syracuse the Rivalry Advantage · Let's Go Amerks! The Rochester Americans talked all week about focusing on winning a the North Division title but after a 6-1 loss on Friday night those hopes will come down to the next game. Syracuse is now five points ahead of Rochester in the standings but Rochester has a game in hand. If Syracuse wins on Saturday they’ll be one point away from clinching the division title. If Rochester wins they’ll have a chance to close the gap to a point on the road in Cleveland on Monday. In ten games between the Amerks and Crunch this season the road team has won seven of those games. So, there’s a chance at a bounce back game. That raises a question, is home ice really advantage in the playoffs? If both of these teams make it to the second round we’ll come back to this question in May. The team that played on Friday night isn’t going to be the same team that plays in the playoffs which raises another question, should the Amerks coaching staff have gone with a more likely playoff roster on the blue line? Would Brandon Hickey and Arvin Atwal or Nathan Paetsch made a difference over Kurt Gosselin and Casey Fitzgerald? In this one game, probably not. But in a big game experience is always more valuable. One thing we do know from the game, these teams really don’t like each other. They talk about it, well, at least the Amerks do, and it shows in the game. The obvious suspects of Dalton Smith and Tyler Randell were constantly stirring things up or responding to plays. Will Borgen was in on the action as well. Frustrations mounted as the Crunch widened their lead. Tage Thompson made the biggest mistake (although he’s not the only one that made mistakes) with a pass in the defensive zone right onto the stick of Carter Verhaeghe in the slot. Verhaeghe immediately turned it into a goal and a 4-1 lead with just over 12 minutes left in the third period. That was the game. Jack Dougherty scored the only goal of the game for the Amerks late in the second period with the help of a Tage Thompson screen. Zach Redmond returned to game play after being out for the last six games with a lower body injury. He had been skating on his own and if the playoffs had already started he would have been playing already. 1st goal – Jack Dougherty made a neutral zone pass in the direction of CJ Smith at the blue line but it was intercepted, the play went the other way, and Alexander Volkov scored. 2nd goal – Rasmus Asplund made a passing attempt to Tage Thompson at the point but the pass was intercepted, the play went the other way, and Gabriel Dumont scored. 3rd goal – Cal Foote tossed the puck at the net from the blue line and went in off the far post. There wasn’t a turnover on this one. 4th goal – Tage Thompson pass to Carter Verhaeghe in the defensive zone and turned into an immediate goal. 5th goal – Kevin Porter attempted to send the puck up the boards in the offensive zone to the point but it resulted in a turnover. Syracuse took off down ice and Brady Brassart scored. 6th goal – Scott Wedgewood attempted to play the puck behind the net leaving it for Jack Dougherty. There wasn’t proper communication on that one. Boris Katchouk scored after Alex Barre-Boulet attacked the puck creating the turnover. All you can do is file this game away in the one off bad game category (for now). Danny O’Regan did not play. He missed two days of practice this week with a day to day injury. He had missed the third period of the game a week ago in Binghamton. Rochester finished 0/6 on the power play with two opportunities coming in the last four minutes of the second period. This was one of those games where Danny O’Regan and Victor Olofsson were missed. Rasmus Asplund didn’t play a bad game but it was clear the chemistry wasn’t the same with two different line mates. He has played with Taylor Leier while Victor Olofsson is called up. Wayne Simpson was on his other wing. Considering Asplund has played almost every game with Olofsson and O’Regan it’s clear that those three know each other well. Simpson has now gone 16 games without a goal and is stuck at 19 on the season. Scott Wedgewood had six goals scored against him but it’d be unfair to put the game on him (unlike his previous three starts). He was making some big saves but wasn’t getting the help needed in front. In his previous three starts the team was finding ways to score and earn points in the standings. There were few gifs due to the nature of the game and a lousy internet connection. Here’s what was shared along with the team highlights.